Digshotep had enlisted in the campaign against the Hyksos. This life changing event had come about by accident due to the success of his winery, still the only venture of its type in the Theban region. Traders coming upriver to Thebes from Crete had told him that wine had a certain purification property. He did not know what made it work but experimentation showed him that it did. Trade was beginning to slow as the Hyksos were cancelling travel permits for foreigners through their territories. They had solid control of Memphis and river traffic was subject to their whim. Wine imports from Crete were slowing to the point they were dry and Digs had expanded his production accordingly. The Pharaoh’s troops had been limited in their ability to carry supplies, especially drink. The only safe liquid was beer and it meant that troops had to stop every day or so to brew more. The vast amount of water in the river which flowed beside them was useless. Even if allowed to settle till it was clear, drinking it could cause all kinds of sickness. Digs’ experiments had demonstrated that mixing wine with the clarified water ( or even unclarified ) as the traders had told him, could make it much safer as a beverage. Wine was also easier to transport than was beer, which needed to be made fresh almost daily. This discovery allowed the king’s army to move much faster as they now could slake their thirst from the Nile simply by mixing one part of strong wine to three parts water. Digshotep stood beside his lead mule, one of dozens loaded with jars of wine, and watched demons approach across the desert. He wondered if Amenhotep were anywhere nearby to witness this deadly miracle? He had not seen his son since the boy enlisted three years earlier. The sun was just setting, heat waves created a quivering haze across the horizon and all was in sillouette. But he could still see clearly enough to recognize his doom as it approached. What kind of magical powers did the Hyksos possess that they could call up demons from the very pit? What kind of power did they get from worshipping the demonic god Seth? It is said they had adopted that ancient Egyptian deity of evil as their own almost as soon as they had entered Egypt. Seth’s domain was the Eastern Desert and the mountains of the Sinai. This god had no business being in the valley. But Digs knew what he saw. Wavering images of tall four legged monsters with human arms, human torsos and men’s heads were rapidly heading his direction. There was no use running from such swift devils. He sank to the ground to wait for the end. Digs raised his head, and his amazement was almost as great as it was when he first saw the demons attacking. There on top of a great long legged, snorting beast, sat his son. “Dad, you don’t need to be afraid. They’re called horses. We captured them from some Hyksos scouts. Have you ever seen such wonderful animals? “Gaaaaak” said Digs, with his usual sense of having just the right word at the right time. Amenhotep slid down from his horse, grasped his still shaking dad and helped him sit in the shade of a rock. “Maybe I had better give you some explainations,” he began. “Gaak,” responded the eloquent Digs. “When I enlisted three years ago, I was assigned to a medical team working directly with the king’s personal guards. I think the old butler had a lot to do with that. “Anyway, when one of the Pharoah’s favorite hunting dogs fell ill, I was called to attend it. The dog lived and a few days later I was called into the King’s presence. “I was then told about a secret weapons program that was being developed for the war against the Hyksos. 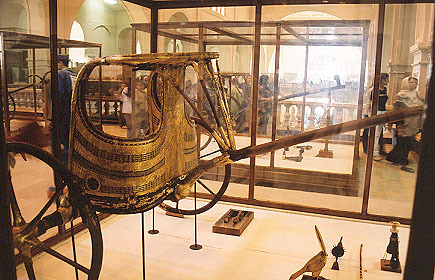 It seems the Hyksos had developed a moving platform on wheels from which their warriors could fight. It was pulled by these beasts called horses. “The king had already captured several of these animals and had them on a secured private estate far south of Thebes. He had established a breeding program and was determined to hit back at the Hyksos with their own weaponry. Except he wanted to do it in a much more efficient manner than the Hyksos. He sent me there as a stable master in charge of the beast’s health. “He had also sent several engineers and architects to try and make the moving platforms even more effective. They were rather cumbersome and not really designed for the terrain of the desert and valley. And they broke down a lot. “Those chariots which we had captured had large solid wooden wheels on wooden axles and were miserable to turn, other than in a wide curve, making them next to useless for close combat. “Our engineers did away with the solid wheels and devised spoked wheels which are not only lighter, but give greater manuverability. We also put tires on them instead of a solid wood rim, that too increases their manuverability. They don’t slide on turns like the Hyksos wheels do. The tires are made of sections of wood tied to the wheel with leather lashings, which pass through slots in the tire sections. The thongs don’t come in contact with the ground, making the chariot more reliable and reducing the number of breakdowns. There are many other changes we made too, such as chariot rails made of one piece of boiled and shapped wood instead of gluing several short pieces of wood together, and covering the axles with metal sheething to reduce friction. “Slaves,” spat Digshotep, finding his voice at last. “Slaves.” That is probably the most abominable thing these Hyksos brought to our land. “Slaves.” And what is even more abominable is that our people picked up the disgusting habit of using such labor. “My father, and his father, never even heard the word ‘slaves,’ let alone know what it means. The great monuments of our golden past were built as labors of love. Every man and woman who helped build the pyramids did so out of the desire to be part of something greater than themselves. “They were not forced and they certainly were not slaves. Every person working on those projects knew they would share the king’s immortality. His life was theirs and his afterlife was theirs. The workers were well taken care of and excellent villages and barracks were built to house them while they worked on public monuments. They weren’t housed in swine pits as ‘slaves’ are. “The people loved the gods and the king was among the greatest of gods. And the gods and the king loved the people back. When we build temples in the future, how will the gods love us back? Those temples will not be built by willing servants but built on the blood and sweat of forced labor. How can the gods then love Egypt, when the very houses we build for them will no longer be labors of love, but monuments giving testimony to terror, pain and blood? “These are the enduring gifts the Hyksos have brought us. Until these Shepherd Kings invaded from Palestine, Egypt never even had an organized army. Now we have secret weapons programs. Seeing his father in such a mood, Amenhotep decided it was time for a change of subjects. “And how is my little sister doing? Is she still hanging on the arm of young prince Amose? “Back to Thebes,” came the cry from the mounted scouts as they swept past. “Back to Thebes. This entry was posted on Sunday, May 28th, 2006 at 12:15 am	by digsalot	and is filed under Discoveries. You can follow any responses to this entry through the RSS 2.0 feed. Both comments and pings are currently closed. On a related note … King Tut is at the Field Museum in Chicago until Jan 2007. I see tickets are sold out for some of the days, so best to plan your visits in advance. Hey Digs, maybe you can place Tut in time and space for us in relation to when your stories take place.